Are we lonelier than ever before? Life in the 21st century is speeding up. Rapid developments in technology are pushing the pace of our lives, to often unbearable levels. As days, weeks and months fly by, we become more and more obsessed by trying to cling on and “prove” to the social media world how brilliantly we are coping. In all of this are we forgetting what is really important, and meaningful? Evidence exists that we are lonely, and getting lonelier. Countless articles are being published on how various towns and villages are creating a renewed focus on community, an antidote for the rise of loneliness. There’s also an interesting development in the world of literature, a newly termed genre called “up lit”. Demonstrated by recent publications such as Eleanor Oliphant is completely fine and The wisdom of Sally Red Shoes, these books focus essentially on the compassion of strangers, providing an alternative world view from the current depressing global zeitgeist– an aggressive manifestation of a self “too busy for other people”, celebrated via the phony gloss of social media. Whereas the earlier genre of “chick lit” was frothier and more about the happy ending, “uplit” offers a more realistic perspective on life – warts and all. Its protagonists are no longer focusing on searching for Mr (or Ms) Right, because let’s face it, ultimately we’re all kind of damaged. There’s a shift towards recognizing and accepting that we are wounded, the focus moved to small acts of kindness and mutual support, rather than the relentless egoistic drive for perfect bodies and perfect partners to worship those bodies. 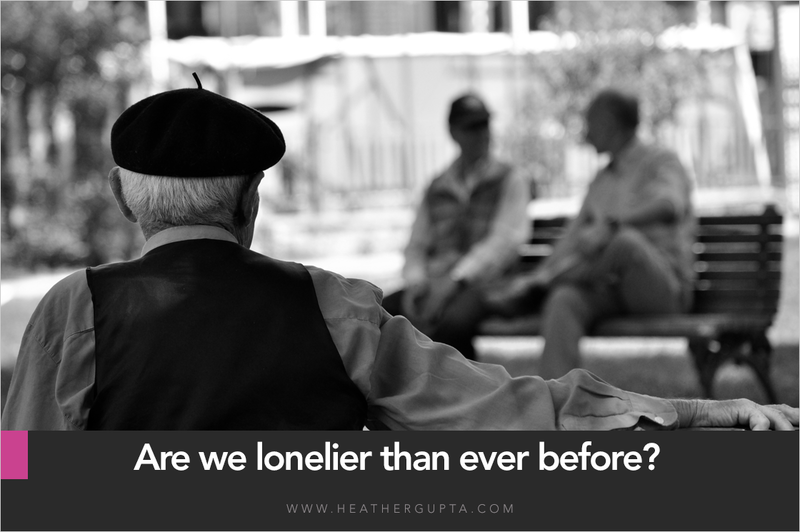 It’s no surprise that loneliness, isolation and self doubt are on the rise. I’ve been talking to friends recently about how different our childhoods were from the experiences of our own kids. My 40-something friends and I look back longingly at our own formative years – characterized by roaming around outside in packs, creating our own fun and play, and bonding with one another, at superficial and deeper levels. These days, our children’s play is monitored, hovered over, and manufactured. Play dates are “arranged”, with suitable play date-ees, and the experiences we have with our kids are often more about the Facebook and Instagram photo ops, than the joy of the event. My own teenage angst revolved largely around which boy I liked, and whether I could afford to see the bands I obsessed over live on stage. These days, that angst is massively compounded by the relentless drive to collect social media likes and shares, with every experience recorded forever in glorious technicolour. Recent reports suggest that younger generations are now officially lonely. I find that the greatest irony of all – I imagined loneliness as being something which comes with age, as people pair up and gradually exchange teen, student and first jobber “tribes” for neat little nuclear family units. There are tons of articles written about the loneliness of life once a partner leaves, or dies, and/or when nests are emptied, but being a lonely young person? That’s new. The health risks of loneliness are also well documented. I believe that the majority of health issues are psychosomatic, and that stress plays a huge role in disease and ill health. Social connection is a basic requirement for human beings to flourish and grow, with “belonging” right up there after food, shelter and safety in Maslow’s hierarchy. We need to feel part of a team, a tribe or a family, yet this relentless drive for self-expression is actually breaking us apart rather than connecting us. I don’t think it’s a co-incidence that cancer is on a crazy rise (tragically, tales of friends and friends of friends battling with, and dying from the disease seem to be commonplace) and mental health issues have seen a dramatic increase in recent years. Life is just too stressful and too damn difficult these days. Where will it all end? It’s hard to tell, but I think that something is going to have to give. Meanwhile, let’s enjoy the new rash of books with their focus on compassion and kindness, and think about how we can extend that into our own lives and the lives of others.